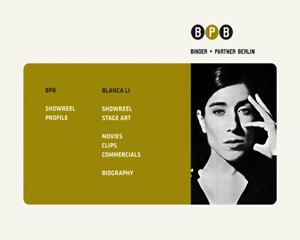 DVD Showreel for choreographer, film director, dancer and actress Blanca Li. Whether performance, opera, video clip or feature film, Blanca Li initiates and realises a great number of projects like the Musical show “Macadam Macadam”, Lorca’s “Poet in New York” or the music video “Around the world” by Daft Punk with Michael Gondry. repertoire: vom zeitgenössischen Tanz über Flamenco zum Klassischen Ballett bis hin zum Hip-Hop. Blanca Li hat u.a. Stücke für die Opéra de Paris, die New Yorker Met oder die Choreografie für das Musik Video “Around the world” von Daft Punk mit Michael Gondry kreiert.